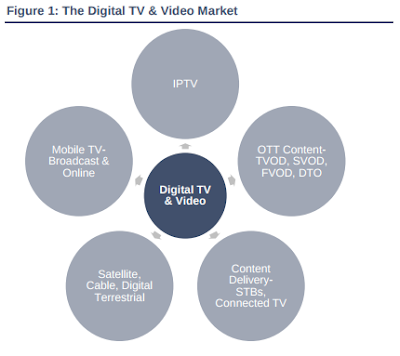 Meanwhile, traditional pay-TV operators and terrestrial over-the-air TV broadcasters will continue to be disrupted by new digital technologies and new business models. Furthermore, the impact of the ongoing video entertainment transformation could also create new challenges for the Cinema theater sector. According to the latest market study by Juniper Research, ultra high-definition television (UHDTV) streaming video services -- i.e. 4K OTT -- content will start to reach the mainstream market soon, with adoption set to soar over the next 5 years. Note, 4K is a term that was originally used to describe the cinema projection resolution of 4096 x 2160 and a cinema aspect ratio of 21:9 on the screen. In fact, many theaters across the world have already shown digital movies in 4K resolution. Juniper’s latest study found that 4K OTT video services are now forecast to attract over 189 million unique users globally by 2021 -- that's up from just 2.3 million this year, driven by greater content availability and compatible devices. In the U.S. market, this means that 1 in 10 residents will be watching 4K online compared with just 1 in 500 this year. While connected TV will likely still be the dominant presentation channel, viewership will take place through a range of devices -- including smartphones, media tablets, and PCs. The new research found that although YouTube, Netflix and Amazon already offer some 4K video, TV network providers have been waiting for a critical mass of content to become available before launching their own 4K offer. However, during 2016 a number of new 4K offerings have been introduced, such as the launch of the Sky Q 4K service in the UK market, coupled with new hardware launches to provide a means of streaming online 4K content. Indeed, device compatibility in the past has proved to be a significant barrier for online 4K video. "The popularity of online video has seen the use of set-top boxes from vendors such as Roku and Amazon soar. However, delivery mechanisms for content have seen slower adoption, as the availability of 4K capable streaming devices is limited," said Lauren Foye, analyst at Juniper Research. "New device launches, such as the 4K capable Xbox One S this month, among others, are likely to spur a boost in 4K usage." While there is one commercially available 8K TV currently on the market (priced at $133,000), 8K content is a long way from becoming mainstream. In a similar scenario to 4K, Juniper Research anticipates 8K smart TVs emerging first, followed by streaming devices and set-top boxes, making this relatively slow market development process. With Japan seeking to broadcast the 2020 Olympics in 8K, the video industry is likely to use this as an opportunity to drive sales of 8K smart TVs. Juniper forecasts that 8K smart TV shipments will grow more than threefold between 2020 and 2021 -- to reach over 400,000 per year by the end of the forecast period.